Since joining the environmental programme “Responsible Care” in 2011, Mayeri Industries AS has laid ever more emphasis on making the production process more environmentally friendly. Although the company’s production process is waste-free, some waste still occurs in the side activities related to production, for example the packaging materials of purchased raw material, plastic packages broken in cargo or energy resources necessary for keeping the factory in operation. In order to minimize contamination, the company has harnessed new technologies which enable reutilisation of the production wastes, the use of more environment-friendly materials for packaging and the production of heat energy from renewable sources with a lower CO2 level. During the last 3 years investment in environmental technology has been at value for 700 000 euro. Handling of waste materials. The carton and plastic packaging waste accumulation of Mayeri is approximately 10 – 15 tons per year. In 2013, Mayeri began to use a device that presses and cuts up the waste of carton and plastic packaging, which has reduced the amount of waste by an estimated 2/3. A large amount of carton waste is reutilised in the packaging of Mayeri products. 1/3 of packaging material of cartons that arrive with raw materials is processed and cut into pieces of the necessary size to use for the packaging of Mayeri products. Such activity has decreased the need to buy and use new materials for packaging, which has helped to spare natural resources and reduce transportation costs and the amount of waste. Environment-friendly packages – 75% less waste. Successfully, Mayeri has begun to bottle washing gel into plastic packages (i.e. re-fill packs) and ever more new packages are sold instead of old cans. 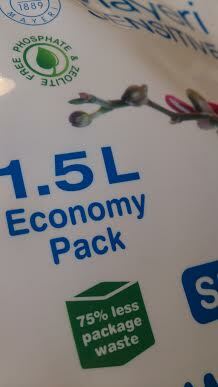 While in 2012 the percentage of plastic packages of Mayeri washing gel was 15.40%, in 2013 it rose up to 37.88%. New packages are more environmentally friendly and produce an estimated 75% less waste than the usual plastic bottles and cans. Changing over to heating with renewable energy. Beginning with the next heating period, in autumn 2014, the chemical factory of Mayeri will be using renewable energy for heating. The material used for heating is wood chips which are bought in from local companies. In changing over to wood chip heating, Mayeri plans to reduce the cost price of production heat by 30% and also clear the burden of the rising price of natural gas. With the harnessed technology, there is no emission of CO2 gas into the environment, because the filters in the boiler completely remove the damaging waste gas. This is another step towards creating a greener image of the company. The company’s future goal is to produce chemical consumer products only using green energy.